I needed a place to store some elephant ears, gingers, cannas, and banana trees for the winter. I mulch most of the cold hardy tropicals we grow around and on the house but I used to dig lots of them and place in a greenhouse in order to get an early start the following spring. But that was many years ago and we wanted something small that would use very little heating to maintain a temperature a little above freezing. It worked, for the most part, but we dis-assembled and scrapped the entire project the next summer. Just didn’t like the way it looked. Here is the story of building the greenhouse and what makes it energy efficient. 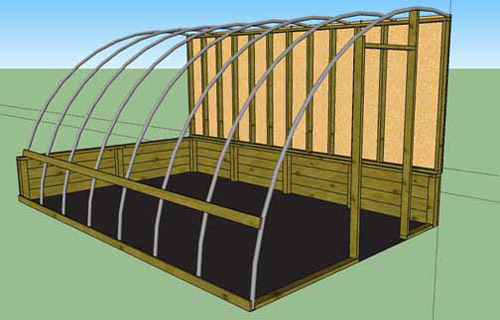 Along with some tropical plants the greenhouse will be used to hold bamboo plants I dig in the fall and winter. Often the air is so dry at that time of the year the plants dry out no matter what you do, unless you can put them in a greenhouse! I only need space for about 50 potted up bamboo plants, after a few days I can move them to the large cold frame. I recently graded this area to add to my plant holding area and as a place to put a large coldframe. I later decided to add the greenhouse. In order to level the area I stepped the grade down 24?. By building the greenhouse into the corner I could use the existing retaining wall for the base and this meant the greenhouse was partially in the ground, a help in keeping it warm. I put foam insulation behind the retaining walls before back filling. 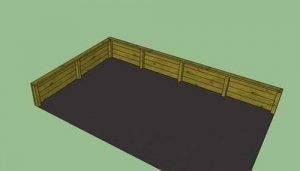 Since the foundation was already in place my first step was to build a 6 foot insulated wall along the north side of the foundation. 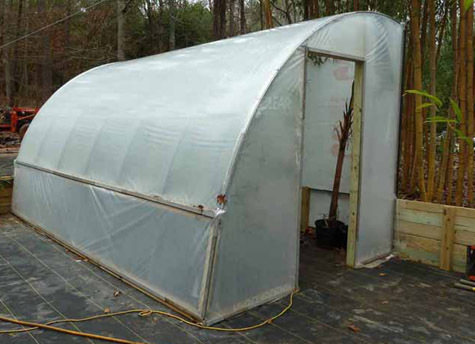 I used eight half hoops I had left from building the coldframe. These were spaced on 2 foot centers. They were attached to the top of the wall with 3 inch screws. 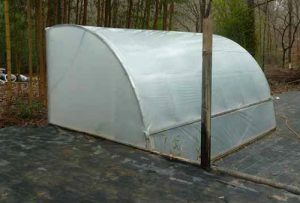 The horizontal 1×4 was used to support the hoops but mainly to accomodate some greenhouse plastic I had. 2×4 treated lumber was used for most of the framing. The back (north) wall had 3 1/2 inches of fiberglass insulation with 3/4 inch rigid foam insulation on the inside. The exterior was treated plywood. The entire greenhouse has a double layer of plastic. This includes the ends and door. I used a fan to inflate the double layer. This helps retain heat in the greenhouse. Because the structure is so well sealed it will maintain a high humidty, just what newly dug bamboo needs. In this final picture I’ve already put a couple of banana trees in the greenhouse and a few Moso bamboo plants. After using the greenhouse last year I found it functioned best as a place to hold newly dug bamboo when it was cold. Within just a few hours plants look strong and healthy with the warmth and humidity. When bamboo is dug up it goes thru a shock, losing a lot of it’s root system and being yanked from the ground into dry air. I bring the newly dug bamboo back to the nusery, water the roots and place them in the greenhouse. After a week or so the bamboo can come out and usually do fine after the short protective period.